Fig. 3-3-1-1 shows the number of persons cleared for Stimulants Control Act (Act No. 252 of 1951) violations (including Act on Special Provisions for Narcotics violations concerning stimulants; hereinafter the same in this chapter) from 1951. Stimulants abuse first commenced during the chaotic postwar period and the number of persons cleared reached its first peak at 50 thousands in 1954, but then decreased sharply. As the background to this, tighter penal provisions, clearance, and thorough implementation of educational campaigns on the harmful influence of stimulants, etc. were pointed out. However, the number of persons cleared started increasing again from 1970 and reached a second peak at 24,372 in 1984. It then turned to a decreasing trend again, falling below 20,000 in 1989, and remained stable until 1994. It started increasing again from 1995 and reached nearly 20,000 in 1997. The number has been generally on a decreasing trend since 2001. Fig. 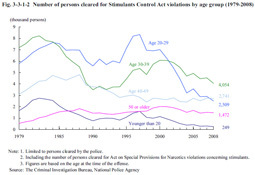 3-3-1-2 shows the number of persons cleared (limited to those cleared by the police) for Stimulants Control Act violations by age group over the last 30 years. The number of those aged 20-29 was the highest among all age groups from 1985 to 2001, but on a significantly decreasing trend from 1998. From 2002 the number of those aged 30-39 was the largest. The number of those younger than 20 has also been on a decreasing trend since 1998. 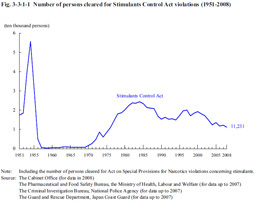 Table 3-3-1-3 shows the number of persons cleared for Stimulants Control Act violations (limited to those cleared by the police) in 2008, the number of persons cleared for profiting from them, the number of Boryokudan members, etc. (refers to regular members and quasi-members of Boryokudan; hereinafter the same in this subsection), and the number of foreign national offenders cleared by type of violation and their nationality, etc. The percentage of those cleared for profiting from Stimulants Control Act violations was 4.9% in 2008. The percentage of Boryokudan members, etc. has been increasing since 2003, reaching over 50% in 2005, and was 52.6% in 2008. The percentage of foreign national offenders was 6.0% in 2008. By nationality, etc., those from South/North Korea had the highest percentage at 28.2%, followed by Iran at 16.4%, Brazil at 14.9%, and the Philippines at 13.3%.